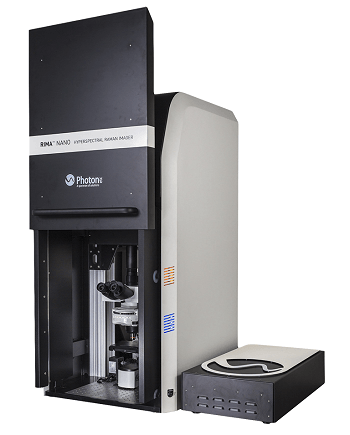 RIMA™ Raman Hyperspectral Microscope from Photon etc. The tool of choice for non-invasive monitoring and analysis of biological tissue, RIMA BIOMEDTM is a cutting edge hyperspectral Raman imager for biomedical sciences, available at an excitation wavelength of 785 nm. Raman spectroscopy is a powerful tool for the non-destructive study of material properties. Stokes and anti-Stokes spectra of SWCNT powder were measured in less than an hour. Raman imaging can simultaneously identify and localize a number of molecular species because of Raman diffusion specificity. RIMA was tested with a Si substrate where a pattern of Ti was deposited. RIMA™ is used to thoroughly evaluate the structural properties of graphene grown in different condition. The intrinsic specificity of Raman scattering combined with global imaging capabilities allows users to assess large of defects, number of layers and stacking order. Because of its high throughput, RIMA™ allows the acquisition of spectrally resolved maps of large area samples, without damaging the surface. Two narrowband tunable filters for resonance Raman spectroscopy (RRS) were designed to study the radial breathing modes of carbon nanotubes. Investigation of CVD monolayer graphene with bilayer island is performed with RIMA™. Large area maps of defects, number of layers and stacking order is used to rigorously study the growth conditions.